Music mogul Simon Cowell's fortune has grown by £40m in one year, according to the Sunday Times Rich List. The X Factor and American Idol judge is now thought to be worth £100m and has jumped 244 places on the list to 700 - the highest climber in pop. Cowell has overtaken singer Robbie Williams, who is now worth £95m - £5m more than last year. Sir Paul McCartney is ranked at 102 with £725m. Full details of the list will be published at a future date. 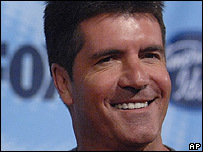 In December 2006, Cowell struck a deal with ITV to stay with The X Factor until 2009, reportedly worth £20m ($39m). He has a variety of TV projects run through his company Syco as well as working as an executive for record company Sony BMG. There are 37 music industry professionals on the list but no pop stars under the age of 30. At 33, Angels star Williams is one of the youngest to make the grade. His Rich List performance comes after spell in rehab and the critical mauling of his latest album, Rudebox.